Monday, June 16, 5:00 pm – Post Father’s Day Dinner at St. Rose Parish Hall Dining Room, 398 10th Street, Santa Rosa. Our June dinner will be a celebration of the regions of Campania and Puglia. Naples is the capital city of Campania. The area is rich in culture, food, music, sites like Pompeii and Herculanuem. Pizza and calzone were conceived in Naples. The capital of Puglia is Bari, known for its olive oil and the Trulli houses. It is the heel of the boot of Italy and where agriculture is emphasized. In keeping with our “Regional Dinner” menus, we will present: Antipasti: Cauliflower & Celery Bruschetta, Entree: Baked Ziti & BBQ Sausages with Salad and Garlic Bread, Surprise dessert! Silent auction and a raffle are planned. Continuing our tradition, please bring photos of your father and/or grandfather. Free raffle ticket with the photo. Doors open at 5:00 – Dinner at 6:00. Prepaid reservations only must be received by June 11, 2014. This entry was posted in Events, Monthly Dinners on May 30, 2014 by Don Raimondi. Monday, May 19, 5:00 pm – Post Mother’s Day Dinner at St. Rose Parish Hall Dining Room, 398 10th Street, Santa Rosa. Our May dinner will be a celebration of the regions of Lazio and Abruzzo. In keeping with our “Regional Dinner” menus, we will present the following: Appetizer: Antipasti and Foccacia; Entre: Roast Pork w/fig sauce & orecchieti w/broccoli rabe, including Herb Salad w/balsamic dressing. Dessert: Abruzzo chocolate cake. Entertainment and a raffle are planned. Continuing our tradition, please bring photos of your mother and/or grandmother. Free raffle ticket with the photo. Doors open at 5:00 – Dinner at 6:00. Prepaid reservations only must be received by May 15, 2014. This entry was posted in Events, Monthly Dinners on May 8, 2014 by Don Raimondi. Come be inspired and learn about classic Italian garden design, history, and ideas for your own garden with Cathy Edger, an active member of the Association of Professional Landscape Designers (APLD). Sheʼll be sharing with us her extensive slide collection of these amazing gardens. Visions of large potted citrus and the limonaia, tunnels of shrubs, dramatic double staircases, sunken gardens, theatrical gardens and more have all stood the test of time. In 2009 Cathy, a former park ranger, along with her 92 year old mother-in-law and 20 fellow members of the APLD visited various villa gardens in Italy. For two weeks they traveled from Lake Como through Tuscany stopping to see gardens from the early Renaissance in the 15th century through the Romantic period of the 19th century. 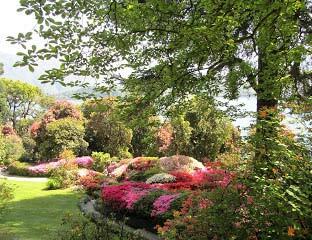 Now you too can visit these gardens with a little armchair traveling with us. A $5 donation is requested for this event. We will have refreshments available for purchase. Please RSVP by calling the NBICF Center at 591-9696. Space is limited so please reserve a seat. This entry was posted in Sundays at the Center on May 1, 2014 by Don Raimondi. This entry was posted in Newsletters on May 1, 2014 by Don Raimondi.